Hawes is a picturesque small market town, with the River Ure running though its centre. Situated at the head of Wensleydale Hawes is England’s highest market town and along with the dale it is one of the biggest honey-pot tourist attractions of the Yorkshire Dales National Park. Market day is Tuesday attracting many visitors and gives the locals the chance to get together at the auction mart and stock up with provisions at the indoor and outdoor markets. The town has other attractions such as the Dales Countryside Museum and National Park Centre located in the former railway station, a ropemakers where you can see how church bell ropes, halters, skipping ropes and washing lines are made using traditional methods to produce a wide variety of rope products and the Wensleydale Creamery where you can see how the famous Wensleydale cheese is made by hand, to a time-honoured recipe, using milk from local farms where the cows graze the sweet limestone meadows that are rich in wild flowers, herbs and grasses. It is this herbage that gives the milk, and hence the cheese, its special flavour. The cheese has been made in Wensleydale since 1150 when Cistercian monks settled in the dale and established a monastery at Fors just 4 miles away from Hawes. There is also a Pottery and nearby is a children’s playground. Hawes is also a great place for walkers and hikers with many footpaths to choose from including the Pennine Way which is the UK’s first National Trail. Hawes is nestled between the hills of Great Shunner Fell and Lovely Seat to the North and Wether Fell and Dodd Fell to the south. Widdale is a small side dale on the south side of Wensleydale and is only two miles from Hawes. It is one of the less well-known dales in the National Park but is well worth a trip for you can experience the feeling of remoteness in amongst the conifer woods or bleak moorland that lie on either side. The dale itself is 5 miles long from Newby Head Moss in the south west to Appersett in the north east. The B6255 that runs through the dale was once a turnpike and apart from Apperset, which only has 23 dwellings, there are no villages or hamlets only a few homesteads and farms scatter the dale. The southern edge of the dale that carries Snaizeholme Beck has been designated as a red squirrel nature reserve. 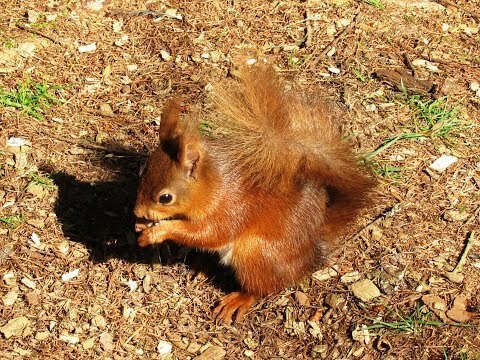 The Widdale Red Squirrel Reserve is dedicated to preserving the native red squirrel which became rare when its larger cousin the grey squirrel was introduced in the 18th century. The decline of the red squirrel in the past years was also due to disease, lack of food and the changes in the natural environment caused by humans but now that is beginning to change with the many schemes and conservation plans going ahead to encourage the red squirrel to breed again. The Snaizeholme Red Squirrel Trail and a viewing area, created by the Yorkshire Dales National Park Authority and local landowners, lie in the heart of the Widdale Red Squirrel Nature Reserve. Although surrounded by coniferous woodland which is an ideal habitat for red squirrels it is sometimes difficult to see in them in such dense woodlands so the viewing area is situated in a clearing offering excellent views of these delightful creatures as they visit a feeder in their natural habitat without disturbing them but you will be surprised to see how friendly and close they get as they run around looking for food to eat and bury. If you are lucky you may also see deer, rabbits, small mammals and numerous species of birds and insects. The Little White Bus operates a pre-book service to the start of the Red Squirrel Trail from the Dales Countryside Museum in Hawes and will pick you back up at an arranged time with the driver. From the lay-by we follow the road with the little river on our right then just before the road bridge we turn left through the gate signposted Stone Gill Foot 1¾ ml. We follow the track with Snaizeholme Beck on our right. When we come to the farm we turn right following the arrow over the stile. We follow the path still with the beck on our right. When we reach a stone barn we cross the wall following the arrow to cross over a footbridge. We very soon bear right uphill to the corner of the wood. At the wood we follow the signpost for Stone Gill Foot. Just before we come to a gate we turn right over a tiny wooden bridge and follow the path round the back of the houses. We soon go through a gate into an open area that has been recently planted with trees. The path continues forward in front of the big house to go through a gate, but we were allowed by the owner to wander down to the large pond. We pick up the path again to cross over a tiny bridge into the wood. We head forward and go through the gate on the right to enter the viewing area of the red squirrels. We spend some time here before exiting the viewing area through the gate and turn right to continue on the path to the left of a house. We head forwards into the trees. We soon leave the trees and pass to the left of a house called Shepherd’s Crook. When we come to a track we cross straight over through the little gate into a large field. We then make our way across the field to the left of the next building, Stone Gill Foot. At the far side of the farm we turn right uphill following the farm track. At the top of the farm track we go through the gate and turn right. We now follow the track which becomes tarmac road until we come to Mirk Pot farmhouse and a footpath sign for Snaizeholme Bridge we turn right here over the cattle grid and follow the path. We come to the farm and a small parking area and keep heading forwards downhill following the arrow. At the bottom we turn left then retrace our steps back to the lay-by car park. This is an easy walk on tarmac, gravel and grass paths and tracks. There are two gradual inclines and declines. Approx 4.5 miles allow 2 hours using OS Explorer Map OL2, Yorkshire Dales Southern and Western areas. This walk is clockwise. Start point: Lay-by two miles from Hawes on the B6255 just before Snaizeholme Bridge. Snaizeholme in Widdale near Hawes in the Yorkshire Dales. From the A1 take the A684 to Bedale, Leyburn and Hawes. Continue through Hawes at the right hand bend take the left turn onto the B6255, the Hawes to Ingleton road. Continue for about two miles and the lay-by car park is on the left. There are no public toilets or refreshments the nearest facilities are in Hawes. The public toilets are in the Market Place in Hawes near the car park. For refreshments in Hawes there are shops, tearooms, cafes, an excellent chippy and four pubs The Crown, The Fountain and The Old Board Inn in the Market Place and The White Hart Inn in Main Street.